Sadako the famous creepy character from The Ring became a pitcher? For your information there's a custom in Japan when there's a baseball games between the famous teams, the first ball will thrown by a famous celebrity there. 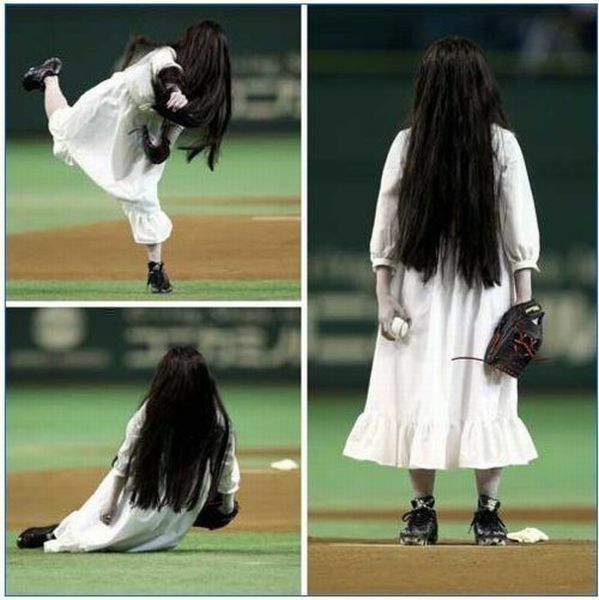 That's why Sadako appear as a pitcher threw the opening pitch at Tokyo Dome on Hokkaido Nippon-ham Fighters vs Chiba Lotte Marines on April 25th. The Reason why sadako appear on this game was due the rumor about the plan of Sadako 3D Film. 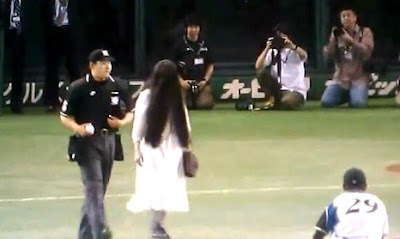 As usual Trademark of Sadako, She wears white dress with her ​​hair over her head.